Security Alert Blog - Are you shopping online during work hours? Includes fun gifts for the family and kids, along with some important updates on current threat activity on the Internet. Just two weeks left to get your Free eBook on Kids Internet Safety. December 7, 2009 Are you shopping online during work hours? What is it? Surfing the internet for holiday gift deals during working hours - using the company's computer and internet connections. Surveys by the National Retail Federation, CareerBuilder and Accountemps suggest anywhere from 20 to 50 percent of U.S. office workers will be browsing retail Web sites this holiday season. Businesses may not like it, but online shopping is very common at work, and according to the article, accounts for a big part of American retailers sales. Not only must businesses protect their computers from viruses, spam and other threats associated with online shopping, but those of us who may be guilty of work hour shopping must practice extreme care and caution when visiting retailers websites. Carelessness can jeopardize our employer's business in many ways - and even subject them to legal challenges if hackers and cyber criminals compromise private and personal information, which could include theft of customer credit card information, bank account numbers and worse. Read the Tuscaloosa News article here for their full story. 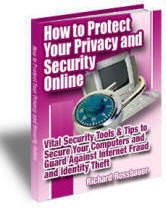 Just a few weeks left to get your Free eBook on Kids Internet Safety. December 4, 2009 What are going to do with that old computer? Thousands of old computers will be replaced by brand new state of the art laptop and desk top machines this year. Christmas, Hanukkah, "holiday" gifts will bring new excitement and capabilities to families everywhere. What do you plan to do with your old computer if new ones arrive at your home? Two major concerns are worthy of consideration - how to keep your old files and personal information from getting into the wrong hands - and where to dump those old machines. If nothing else, remove the hard drive, and if you don't intend to use it elsewhere, physically destroy it! Monday, Nov 30, 2009 Cyber Monday! Is your computer prepared for it? find gifts, there will be thousands of cyber criminals lying in wait for them. You can avoid the treats they pose just by exercising good judgment, like making certain that your firewall, anti-virus, anti-spyware, and Operating systems are up-to-date, and you don't allow your excitement and determination to cause you to drop your guard. There will be a variety of clever scams and tricks aimed at trapping you. Software, and others are working hard to help us stay safe. June 30, 2009, Symantec received reports of 43 million rogue security software installation attempts from those 250 distinct samples. messages that purported to come from Media Service. The email bears the subject, Congratulations, and informs users that they won a Macbook Air. Steps to Online Safety at their Security Center. All of these experts point out one major thing - being aware of the threats and practicing common sense and good judgment will go a long way toward avoiding trouble. Makes sense to me - how about you? Flash drive, jump drive or thumb drive are all names for the same kind of storage device. They are portable. You can use them anywhere you have a computer with a USB port. Your data is always with you when you need it. They are durable. You can hang them on a lanyard, place them in your purse or in your pocket. November 15, 2009 Are You making Plans for the Holidays? So are we. Our plans include participation in the U.S. Marines 9th annual Toys for Tots program, and we are proud to be a part of it again this year. United States will not have a single gift to open on Christmas Day! We aim to change that and make sure every child has at least one present from Santa under their tree. Won't you join us? It's a rewarding experience and warming thought that we can help a needy child enjoy the holidays simply by clicking on a link, or image on a webpage. November 11, 2009 Yesterday was Microsoft's Patch Tuesday. It's a good idea, and I suggest it's better insurance to select and follow the postings and announcement of the Security Software manufacturers if you want to be aware of the threat levels of Cyber Space. "Today (November 10) is Microsoft patch Tuesday and we are told there will be six updates, four for Windows (Win2K, XP, Vista as well as Server '03 and '08) and two for Office. Important note: Adobe is recommending that users upgrade their Shockwave Player to version 11.5.2.602 multiple vulnerabilities that can lead to execution of arbitrary code have been reported ...etc"
Good idea to check that your systems and software have these updated patches. Interesting post at the Google blog regarding passwords - how many we accumulate, have to remember, and often re-create for many of the sites we regularly visit. Thanks to the utilization of new technology, Google reports seeing large-scale success in eliminating the need for passwords while increasing the successful registration rate at websites. The most visible examples come from Plaxo, Facebook, Yahoo! and Google. We'll still have to practice proper security precautions in protecting our passwords, but there might just be fewer to defend. For a limited time only, I'm offering my ebook on child safety - "Keep Your kids Safe Online" as a FREE gift for visitors to my Family Safety website. When you get there, find and click on the "Click Here to Get a FREE Copy" link above the image of the book. Hurry on over and get your eBook now before I close the offer on Dec 31st. If you do it now, it won't slip your mind, and you'll be able to download, and even print it for sharing with your children and other family members. October 16, 2009 Are you backing up your computer data - regularly? Computer crashes for businesses can be even more devastating. Many times smaller businesses rely on just a few computers, each possibly dedicated to specific tasks. Crashes could involve losses of customer lists, sales records, inventory data, product data bases, even personal records of employees. The October 3rd issue of the Security Alert News Reporter now available with some mighty interesting and valuable insight into the sneaky stuff still spreading through cyber space - and protection tools - some FREE. Company named "Microsoft Security Essentials"